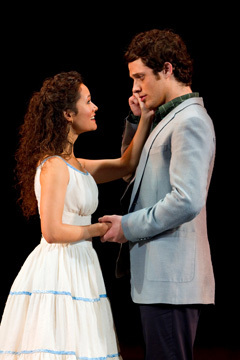 "West Side Story" is one of the gems of our American Musical Theatre. Created in 1957 by Leonard Bernstein, Stephen Sondheim, Arthur Laurents and Jerome Robbins, the story is set in 50s New York City but inspired by "Romeo & Juliet." Two rival street gangs -- The Sharks and The Jets (the Puerto Ricans and the whites ) -- are fighting to control their territory in Manhattan. The real conflict comes when Tony, the leader of the Jets, falls in love with Maria, the sister of Bernardo, the leader of the Sharks. Violence escalates and Bernardo winds up killing one of the Sharks. Tony, who had been trying to calm the gang members, winds up killing Bernardo in a rage. Tony is dead as well by the final curtain. Theater fans know that the show was originally conceived as a story of family conflict between Italians and Jews. The first draft was called "East Side Story." After some initial work, the piece was put aside, only to be resuscitated a decade later, revised as a tale of feuding street gangs. This is a masterpiece that flies or falls on its electrifying dancing. The artful choreography by Robbins (as recreated by Joey McKneely) is iconic. There's no mistaking that it belongs in any show but this one. And in the case of the national tour rounding out the Broadway Across America season at The Colonial Theatre, it succeeds beautifully. The show begins with a finger-snapping cold open -- we're on the streets of Manhattan and the gang members are marking their turf via dance. There's not a word to be said, but you know exactly what's going on. The show's musical score is one of the theater world's most recognizable, including "Tonight," "Maria," "I Feel Pretty," "Something's Coming," "One Hand, One Heart," "A Boy Like That / I Have A Love," and "America." The opening sequence sets the pace for an evening that just zings along. The highlights include the frenetic "Dance At The Gym" (above), the tense and aggressive "Cool," the taut tableaux of the "Tonight Quintet" and the haunting "Somewhere." The individual members of the company all get their moments in the spotlight, with Michelle Aravena (far left) as Anita, girlfriend of Bernardo and confidante of Maria, rising to deliver a performance that's fiery one minute and funny the next. She leads "America" and shares the heart-pounding "A Boy Like That" duet with Maria. 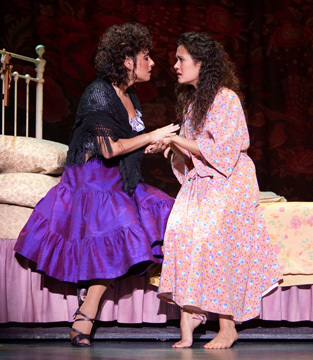 In turn, Ali Ewoldt (as Maria, at left in pink) has a glorious voice that wraps itself around whatever she sings. German Santiago is a striking Bernardo. Also good is the comically raunchy "Gee, Officer Krupke" gang member ensemble number led by Drew Foster as Action. In the dream sequence, tomboy Anybodys (Alexandra Frohlinger), who longs to join the Jets, leads the company in a heartfelt "Somewhere." And in the small role of the school dance chaperone, Stephen DeRosa is very funny. While the dancing is crucial to the success of the show, it's heart is the ill-fated romance between Maria and Tony. In this case, Kyle Harris (at left with Ewoldt) is an odd choice as Tony. He's questionable as a gang member, he leans on an overt vibrato when he sings, and when he approaches high notes, his voice takes a really odd turn. While Joey McKneely recreated Robbins' original choreography, David Saint directs the show in keeping with the vision the late Arthur Laurents had when he re-conceived the most recent revival on Broadway. 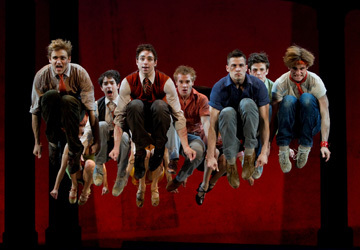 Among his touches, Laurents had a portion of the dialogue and lyrics delivered in Spanish (as translated by Tony Award-winning Lin-Manuel Miranda of "In The Heights"). While some audiences in New York took exception to this, it does add a touch of authenticity. And whether you speak Spanish or not, you always know exactly what's happening on stage. The moment that could have more power comes at the final curtain after Tony's been shot. I don't know if this particular staging was Laurent's choice, but it feels incomplete and could use a more satisfying emotional finish. Still, in the end, "West Side Story" remains a masterful ensemble piece, artfully fashioned and sharply executed. And while it's story may be set six decades ago, it's emotional edge and message lives on. 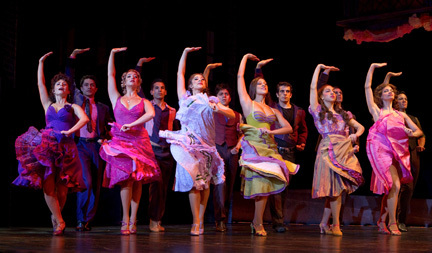 "West Side Story" is at The Colonial Theatre through July 9. For information, call 800-982-2787.